Chic and I recently wrote an article entitled "Musings on the Magic Squares" for the Hermetic Virtues Magazine (Volume 5, Edition 17 - Autumnal Equinox 2011), In it, we describe some of our own observations and musings about the magical squares, based upon personal meditation gained through Vault meditations. The three areas covered by our "musings" include Geometric Gematria, Polyhedral Qameoth, and Truncated Pyramid Qameoth. 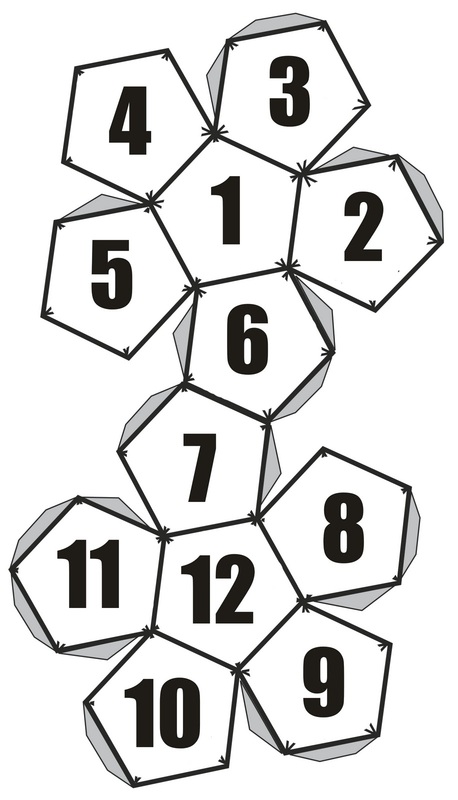 Some of our "musings" concerns the creation of three-dimensional polygon magical squares that we call Polyhedral Qameoth (polycams for short). 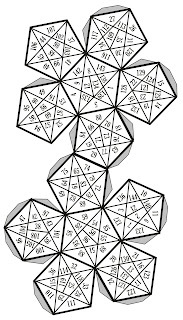 By applying the magical squares to the platonic solids and other polygons, we not only create 3-D versions of some of the magic squares, we can also create 3-D versions of the various sigils traced on the traditional planetary Qameoth, traced from number to number and from side to side. 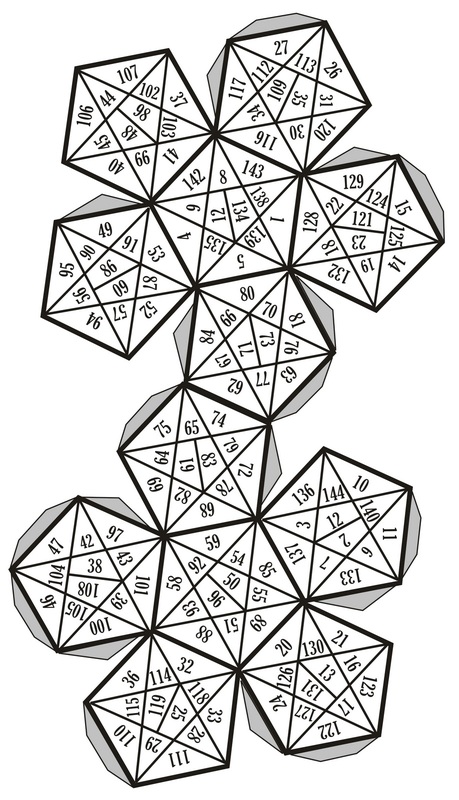 One polycam that did not make it into our article was that of Mazzaloth, the doubly-even magic square of the Zodiac, based on a 12 x 12 grid of numbers, used for making zodiacal sigils. 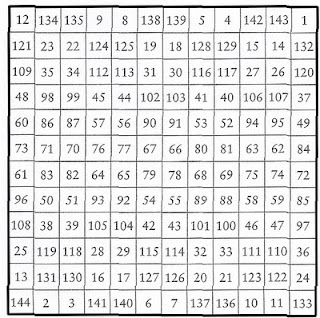 This magic square was first published in the article "Mysteria Geomantia" by Adam Forrest (The Golden Dawn Journal Book 1: Divination, reprinted as Basics of Magic: The Best of the Golden Dawn Series: Book One: Divination). 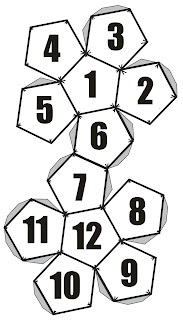 The platonic solid used for the Mazzaloth square is the dodecahedron or twelve-sided figure. 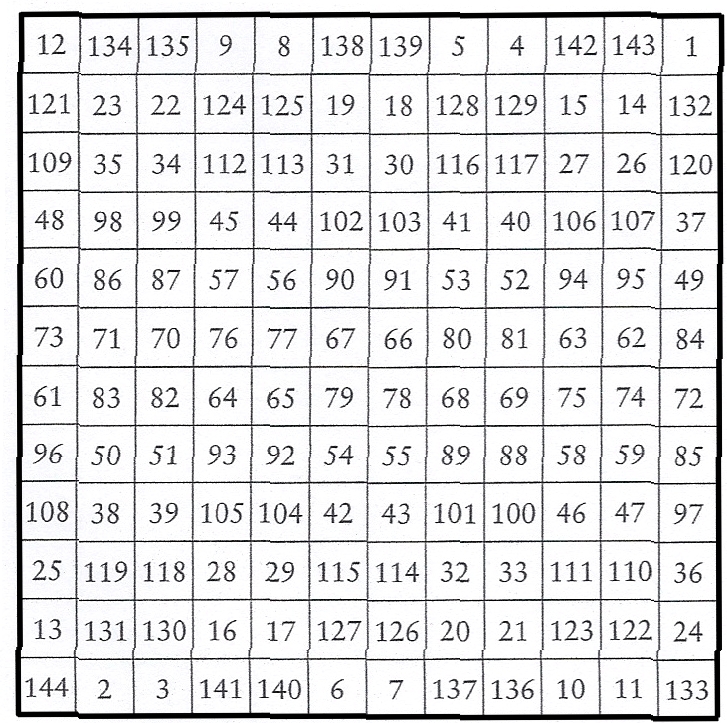 Each line of the magic square is used on one of the sides of the figure. We don't consider it as elegant as the other polycams presented in our "musings" article, but it can be useful for creating 3D zodiacal sigils. The second method would be used to support the Fixed Sidereal method of the Golden Dawn's esoteric astrology (beginning with 0 degrees Leo). HOWEVER, I am much more inclined to use the first method (Aries-Pisces) which employs the connection between the invisible spectrum of colors (infrared and ultraviolet) as the doorway to the unmanifest. When the Golden Dawn split apart in 1903, Waite became the head of what had been Isis-Urania Temple and it became "The Holy Order of the G:.D:. under the Obedience of The Independent and Rectified Rite." In 1915 he closed down the Rite and established the Fellowship of the Rosy Cross (the FRC). The focus of the FRC was on mysticism rather than magic. Waite’s collaboration with artist Pamela Colman-Smith, published in 1910 as the Rider–Waite Tarot, is without a doubt the single most popular tarot deck in the world today. However Waite produced that deck for the general public. Waite’s esoteric tarot deck, called "The Great Symbols of the Paths" contained only the tarot trumps. The images were painted by John Brahms Trinick, an Australian artist who was also a member of the FRC. Trinick was an accomplished Art Nouveau illustrator in watercolor, pencil, pastel and crayon, and a collection of his watercolour copies of European stained glass windows can be seen at the Victoria and Albert Museum. These were not cards for divination, but cards purely for meditation and ritual work within the FRC. The original color paintings, which we saw at the London headquarters of the FRC in 2005, were all framed and used, as they still are used today, in the ceremonies of the FRC. I have to state for the record that members of the FRC to whom I have spoken are not at all happy with the publication of their ritual cards. In their words: "we condemn absolutely the publication, reproduction and indiscriminate use of these sacred symbols, and look upon those who initiate such publication and reproduction as persons who utterly lack integrity and bring shame upon their esoteric communities." Chief: [...] "The symbolism with which we are here dealing also recalls the Apocalyptic figure of the Lamb slain from the foundation of the world, and in correspondence with previous explanations, it indicates that the palmary misfortune of the universe, which is exoterically called the Fall of Man, exercised a species of incomprehensible compulsion upon the Divine Nature, so that the scheme of what is familiar to everyone under the name of redemption comes before us in a certain manner as an eternal necessity and as a consequence of the free will rather of man than of God. The importance which has been attached throughout the Grades of our two Orders to Egyptian symbolism should also remind us that Mem, through the sacrifice of Christ , has analogy with the legend of the dead Osiris, one of whose appellations was the shipwrecked or drowned Mariner, even as this terrible Key, which you see now in its true form, represents a drowned giant ." "The 23rd Key of the Tarot is referred, as you are aware, to the Elemental sign of Water, and in this diagram the drowned giant is depicted reposing on the rocky bed of the ocean with the rainbow at his feet, corresponding to that which has been sunk below the phenomenal world by a sacrifice eternally preordained, which, in one of its aspects at least, is the necessary limitation suffered by the Divine Nature in the act of becoming manifest. The Divine, in a word, is drowned in the waters of natural life; and that which in this respect obtains in the external world, obtains also for humanity, wherein the Divine Spark, beyond all plummets of the sense, all reach of the logical understanding, is immersed in the waters of the material existence. In both cases, the symbol with which we are dealing corresponds to the legend of our Founder, sleeping in the centre of the Tomb, which is encircled by the Rainbow, as in the Sanctuary of Israel there was the abiding Presence of the Shekinah. We must remember, moreover, that the ocean of phenomenal life supports on its surface the mystical Ark of Noah, which, in one of its aspects, is the Vessel of Correspondences, wherein the types of all things were collected from the wreckage of the old initiations for transmission through a new era. In another sense, which is intimately connected with the first, the Ark is the body of man, the ship of humanity, poised on the waters of the world which conceal the divine within them. It is man, collective and individual, man in possession of his senses and also enclosed by his senses. There is that within him which, during this his time of probation is put to sleep as deeply as the symbolical Giant. His originally great nature is restricted in the body after the manner of God in creation. There is yet another aspect in which we may regard the Ark, for by many issues the great symbols open upon the Infinite which they show forth, though it is after the manner of a reversed glass minutely. It is that namely, which for a time suspends the soul's communication with the external that she may receive the influx of the Divine. It is the house of deep contemplation, of fixed, well-directed thought, by which our exit is found for a time, even from thought itself, to the world of true experience. The ceremony of the 6-5 Grade symbolises this indrawn state, in which connection I would ask you to remember that in the roof of the Ark of old there was a window through which the Dove passed and repassed, now in frustrated flight, because many wings are beaters at the Golden Gates; now bearing the olive-branch of peace which for us signifies the suspension of the life of the senses. But, in fine, there came an hour when the dove returned no more, because the aspiration and outreaching of the soul at length attains its term. Beloved brother, we have dwelt at great length upon the import of certain symbols, for albeit the work of detachment may operate scarcely less in suspension from the world, yet it is through many types that we pass ultimately behind the veils." I first saw these cards by Trinick ("The Great Symbols of the Paths") when author and historian R.A. Gilbert gave a complete slide lecture on them at the 1998 International Golden Dawn Conference in Bayonne, NJ. With the owner's permission, I have been giving a slide lecture presentation of some of these cards (both black-and-white and color versions) as well as other Pre-Golden Dawn Tarot images, since 2006. For those who are interested, I plan on giving this same tarot lecture ("Images of Initiation: The Hermetic Tarot") at Pantheacon 2012. It would certainly be intriguing to discover whether Trinick produced a second set of original watercolor paintings in addition to the ones owned by the FRC. If so, this discovery is truly a breakthrough in the history of post-Golden-Dawn tarot images. I can't wait to see them!